It is perhaps symbolic that it was the press gallery that took the brunt of the leak that affected the Commons chamber yesterday, forcing the sitting to be suspended. Early rumours suggested the leak was sewage, which would have been even more appropriate. But, with the MP collective taking time out from Westminster today, the harassed maintenance staff have until Monday to deliver a quick fix. If they succeed, perhaps they could be asked to turn their attention to Brexit. It is inconceivable that they could do a worse job than the "mentally and physically exhausted" darlings who normally inhabit the chamber. It might also save the £3.5 billion needed to restore this gothic wreck, especially if it is bulldozed into the Thames and the site repurposed for something useful. Over in "the other place" – the term used for the House of Lords – their noble Lords gave up on the arduous process of debating the fatuous Cooper Bill at about 10.40 in the evening, despite the original plan to carry on past midnight. And since they too are not sitting today, proceedings are to resume on Monday, extending the original timetable and, incidentally, allowing time out for reflection. Meanwhile, the May/Corbyn talks seem to be progressing but, without cabinet ministers present to text the details to their "mates" in the media, there is not an awful lot coming out of the conclave. Frankly, that which is leaking is about the same quality as that which was rumoured to be leaking into the Commons. The Financial Times, though, is seriously downbeat, suggesting that hopes of a deal with Labour were "fading" as the talks broke up without agreement and "opposition to the initiative hardened". Talks, we are told, are continuing today, proving that there is still some sign of life in the political capital, but there seems nothing of the sense of urgency one might expect. One would scarcely believe that the "colleagues" are set to hold their European Council on Wednesday, whence they will deliberate on whether to approve an Article 50 extension. If the Commons, on the one hand, are to consider the May/Corbyn proposals and then, for an encore, have another stab (to use an unfortunate phrase) at approving the Withdrawal Agreement, then they are running desperately short of time. As yet, it seems that cabinet ministers are divided as to the period which should be requested by the prime minister, and yet another plot – so beloved of the media - seems to be brewing to prevent Mrs May opting for a long extension. With a possible hiatus in the May/Corbyn talks looming, attorney-general Geoffrey Cox has told the BBC that if the talks failed the prime minister could be forced by EU leaders to accept a "long" delay to Brexit - longer than just a few weeks or months. Nothing has been decided, although the prime minister is expected to send a letter to Donald Tusk "in the next few days". Whether she intends to consult the cabinet before the letter is sent is not known. Despite that, the politicians have decided to work a four-day week – now enforced on MPs whether they like it or not. This creates something of a risk that Mrs May will turn up empty-handed in Brussels, not knowing how long she wants, or requesting a period for which she has absolutely no backing. Crucially, she will have absolutely nothing to offer in terms of a "way forward", and no Withdrawal Agreement. This will give the European Council very little to work on, and without a brief from the General Affairs Council. Given the earlier pronouncements from Barnier and Juncker, it could end up failing to grant an extension simply because no acceptable case has been made for one. It seems hard to believe that Brexit (or the first stage, at any rate) could be set to end with a whimper rather than a bang, but the fact is that our membership ends at midnight in a week's time, unless something pretty dramatic happens to stave it off. And if there is nothing for the "colleagues" to work on, it seems hardly likely that they are going to entertain a request for more time to process a request for more time. That could go on forever. However, as would appear from the intervention of Angela Merkel in Ireland, where it appears that the Irish are not ready to police a hard border, the "colleagues" are keen to avoid a no-deal Brexit. They may, therefore, be planning an ambush by presenting Mrs May with a take-it-or-leave-it proposal for a lengthy extension. This could dramatically change the character of the domestic debate. Acceptance of a lengthy delay to Brexit could trigger an implosion in the parliamentary Conservative Party, and mass resignations in the cabinet. From there, with her party and government in tatters, the talk is of Mrs May being forced to call a general election. This would be by whatever devious procedure is available, including the possibly of a vote of no confidence in which cabinet members might vote against their own government. 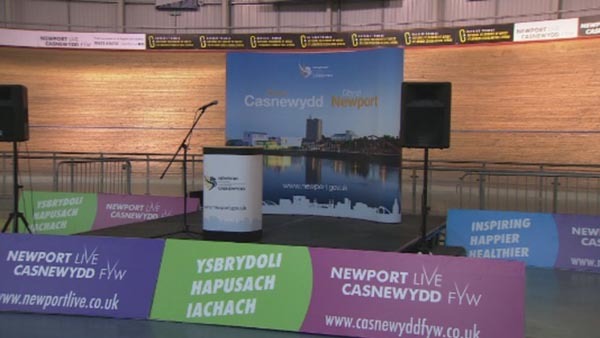 In a bid to enliven these otherwise rather dull politics, though, we have a by-election in Newport West to entertain us. Site of the Chartist rising in 1839, Newport gets its election as a result of the death of Paul Flynn. The result brought a victory for Labour's Ruth Jones in what is a traditional Labour stronghold. A low turnout delivered a reduced voting share, down 12.7 percent. The Conservative vote was also down, by eight percent, while there was a strong showing from Ukip which increased its share by six percent to give it eight percent of the vote, putting the party in third place. The throbbing vibrancy of the campaign can be seen from the picture (top). The Labour victory gives Mr Corbyn's party one extra vote, but it would be rather ironic if one of Ruth Jones's first actions is a vote which led to the dissolution of parliament and a general election. At least she might then be returned, as the received wisdom is that the Tories face electoral annihilation in the event of an (even more) bodged Brexit, despite the latest Westminster poll putting the Conservatives in the lead with 36.6 percent, as against Labour on 34 percent – both parties down seven percent on the Britain Elects poll tracker. In a possible harbinger, Ukip is up five percent, despite the leadership of the loathsome Batten. For the here and now though, the scenario we would could be facing is that the May/Corbyn talks end without a conclusion – with or without a dramatic walk-out by Mr Corbyn. We then see the cabinet failing to agree on a period for the Article 50 extension, with Mrs May going to Brussels to face a demand for a politically toxic long extension. Assuming the Cooper Bill has not received Royal Assent, Mrs May then returns to the House to face the music. If she has refused the European Council "offer", we will be out of the European Union by next Friday. If she accepts it, she is out of office. As always, though, there is another "get out of jail free" card hovering in the wings. Mrs May could take a long extension with the option of an early termination, contingent on parliament ratifying the Withdrawal Agreement. This is being labelled a flexible extension or "flextension". By such means, the prime minister could place the responsibility for ending our EU membership squarely on the MP collective, leaving them to decide whether (or when) we depart. The quantum thus becomes "my deal or no Brexit for the foreseeable future". The capacity for MPs to bottle it, though, is endless. One scenario sees the Cooper Bill in force, whence Parliament attempts to send Mrs May back to Brussels to demand a new date – an effort that must surely fail – or even a retreat from reality, where parliament changes tack and opts for a "confirmatory referendum", leaving it for the people to decide on whether to accept the deal. Should this become an option, the debate will doubtless shift to the nature of the questions to be put, and whether voters are given the choice of deal or no deal, deal or remain, or a three-cornered referendum which offers all three options. How that latter variation would work is not clear. Nor is it even clear that a multi-choice referendum would be allowed by the Electoral Commission. In that context alone, the idea of another referendum could prove as contentious as the main Brexit debate, and that is without addressing the practicalities of which groups would be the official campaigning bodies, and how they would be funded – given the possibility of criminal proceedings on certain aspects of the last campaign. There is then the possibility that, with the highly contentious role of social media advertising still unresolved, the outcome could end up being just as strongly disputed as the 2016 result. And then, there is the ongoing uncertainty which continues to be highly damaging to business confidence and operations. Nevertheless, of one thing we can be absolutely certain. In the first week after we should have left the EU, we are still part of the "evil empire". And while we have a provisional date for leaving, there is no certainty that this will be Brexit day – or even that there will eventually be a Brexit. We are no closer to a resolution than ever we were.